In today’s daily chart watch we are looking at a potential reversal in the British Pound. We’ve also got interesting inside bar patterns to look at in gold and silver and some well formed chart patterns in EUR/USD and GBP/JPY. Let’s jump into it. 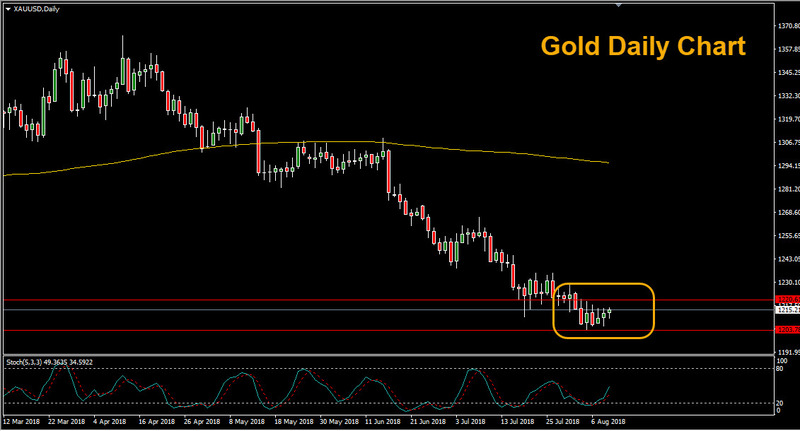 In both gold and silver, price has been consolidating at the bottom of a downtrend with a series of inside bars (bars contained within the previous bar). The pattern indicates that the market could be ripe for a breakout above the high or below the low of the ‘mother bar’ (the bar containing the others). Sterling has been taking a beating in recent days amid fears of a ‘no deal’ Brexit. However, the market is showing signs that the pound may be due for a bounce. Hammer (bullish reversal) patterns are forming on the GBP/USD, GBP/AUD and GBP/CAD daily charts. Meanwhile a shooting star (bearish reversal) is forming on the EUR/GBP chart. A nice pin bar reversal already formed on the 4 hour chart. EUR/USD is contained within a descending triangle pattern and has been drifting upward with rising momentum. However, bears are looking for a potential breakout to the downside, eyeing the yearly low of 1.1508 and the major 50% retracement level at 1.1447 . In the volatile GBP/JPY pair a well defined wedge pattern has formed, presenting potential breakout opportunities in days to come.